Go through the Android phones of 10 random people and you’ll find hundreds of music in at least 9 of them. 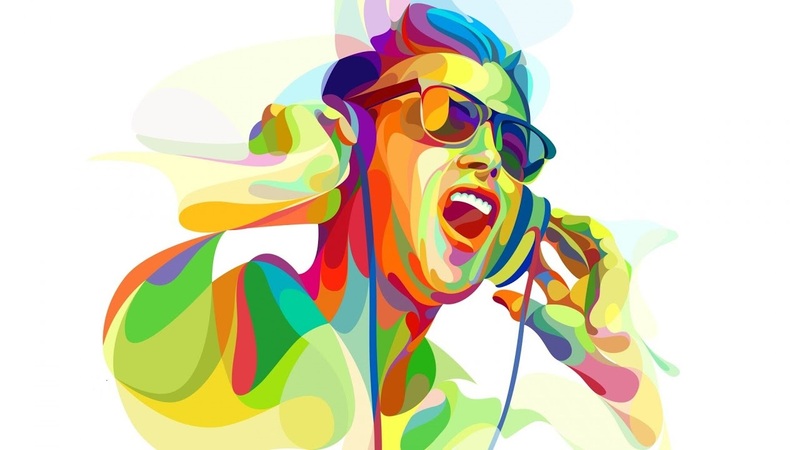 It will come as no surprise as people love music, music connects people and makes them feel good about themselves as they listen to the melodious sound, grab the message behind it and sometimes even shake their body to the rhythm. Back then we listened to our favorite and popular recorded best music such as Afro-beats, Country, Hip hop, Blues, Jazz, Rock, R&B, Alternative, Fuji, High-life, Caribbean, Pop, Electronic, Reggae, Folk, Classical, Grunge, Folk, etc. on Radios and TVs then graduated to strictly hardware music players like Palitos and iPods. But with the advent of mobile phones especially android smartphones, while giving us access to a lot of things has also served as digital audio players enabling us to play our music any time and at any place through music playing apps for free. 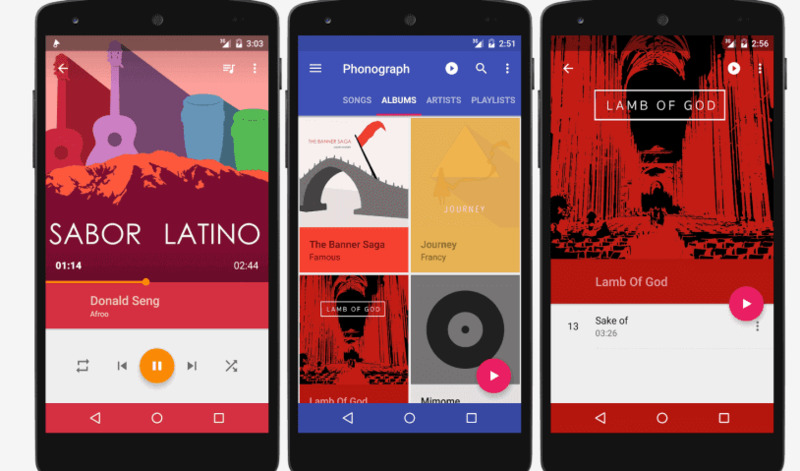 Today, in no particular order I’ll be listing the best music player applications for Android phones for free downloads that come with tons of features which makes listening to music much more joyful. 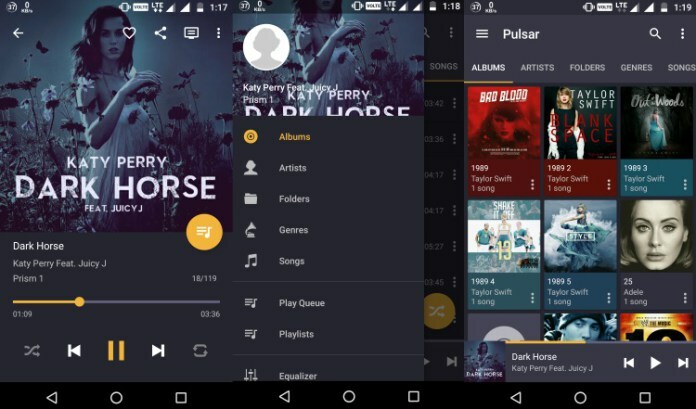 Pulsar is developed by Rhythm Software is one of the best music player app for free and very exciting to use. The music app scans for music on your android smartphone automatically so that when you open the app it already loads all your songs and doesn’t require you scanning. Pulsar library view sorts through your music by album, artist, genre, genres, songs and the option to create more music playlist is allowed. The free version offers quite a good number of features though not like the paid one but it suits the purpose of people wanting something not too much. Pulsar UI is so slick and runs smoothly and can be customizable with various themes and while running it is ad-free. A con however is that it loads audios of just about any format so while scanning automatically it sometimes pick voice recordings or Whatsapp audios and play them. Major Features Of Pulsar Music Player App: It is lightning fast and has Chromecast support, gapless playback, home-screen widget, and can automatically download the correct album art of tracks. Download Pulsar for free on google play store. Like to know the lyrics to your favorite song as you listen to it? Then why not try Musixmatch. 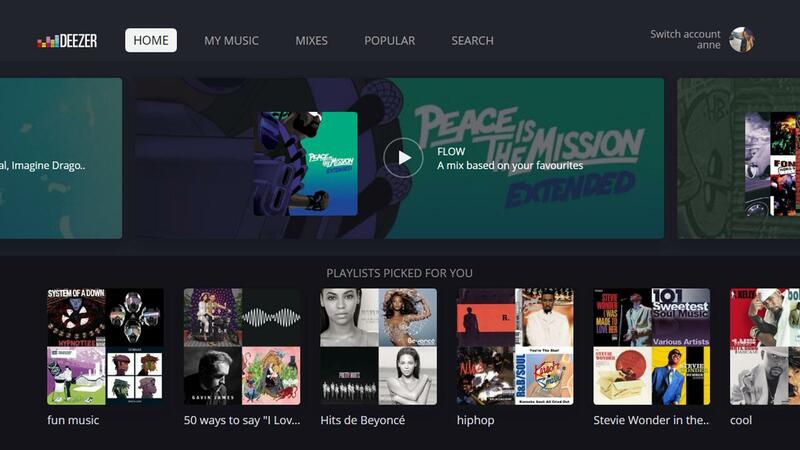 Founded in January 21, 2010 Musixmatch basically serve as a platform for users to search and share lyrics of songs. Musixmatch is the best at displaying lyrics synchronized with music being played by a floating bar. It however has its own music player which is quite very good. 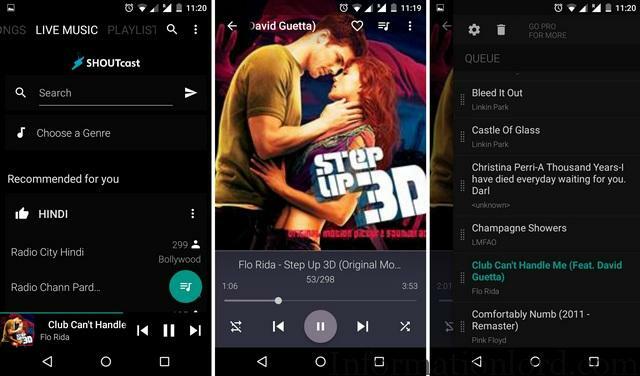 It also automatically loads the music on your android phones to its music player and finds lyrics to all the tracks. Musixmatch also supports music streaming services like Spotify, Google Play Music, Deezer, Rhapsody etc. The UI of the music player is user friendly, simple to use and loads music files very fast. Major Features OF Musixmatch : Lyrics finder, Chromecast and Android Wear support, 5-band equalizer, a simple but effective music player, offers music streaming services, can enables users make photos of their favorite music lyrics and share them. Download Musixmatch for free on google play store. Google provides just about any service right now and it should come as little surprise that they have one of the best music player application for android phones for free. Google Play Music can be used to play any local music (music stored on your android phone for free) and it enables you to upload up to a whopping 50000 music files to its upload manager from anywhere you are storing your music. The UI is friendly and can be navigated easily. 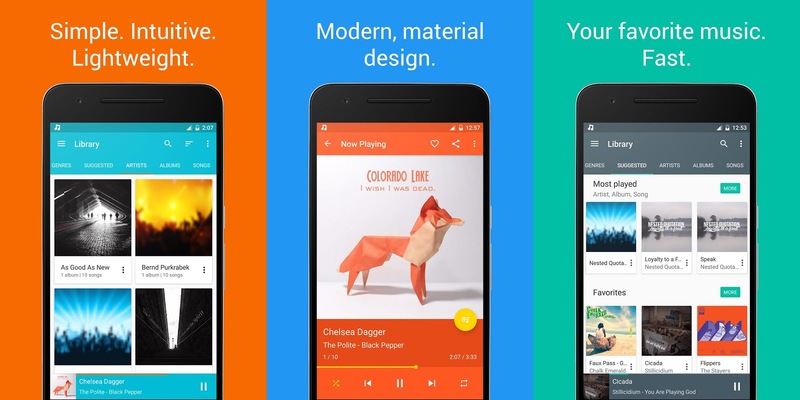 Google Play Music can also be used as a music streaming application. It is free for standard and the paid version range from about $10. Supported file formats for upload include: MP3, AAC, WMA, FLAC, Ogg, or ALAC. 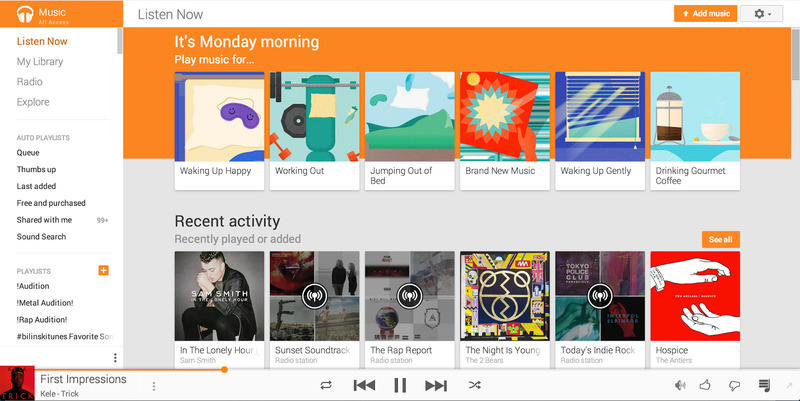 Major Features Of Google Play Music: Free online storage and listening for 50000 songs, Chromecast support, custom radio stations. Download Google Play Music for free on google play store. Phonograph is a very good music player app for android phones available for free. It banks on aesthetics. Its UI is slick and isn’t complicated and has a twist as Phonograph tend to change colors to match with the album art of the song currently playing. Phonograph music player automatically downloads missing information of your music media, has a built-in tag editor and allows you to create a music playlists to its already categorized library. It can sometimes run slow on android phones that have huge libraries but makes up by being an ad-free app which makes it one of the best music player app. So you can listen to your music for free without being scared of ad pop-ups. Major Features Of Phonograph: Last.FM integration, home-screen widget, lock screen controls, gapless playback, sleep timer. Download Phonograph for free on google playstore. If you looking for a simple and free music player for android you should try Shuttle. It has quite a lot of features as you can create music playlists, manage a queue, edit music tags, browse folders, view lyrics and even download album artwork. The UI looks good as it allows you chose from a huge number of themes, customize layouts or change what happens when you plug your headphones in or out. Shuttle also has one of the best embedded lyrics and customizable widgets. It also takes advantage of Android UI features with lock screen and notification controls and widgets. It has a ton of features and it is free. Major Features Of Shuttle Music Player: Gapless playback, six band EQ, last.fm scrobbling, Chromecast support, ID3 tag editing, supports 3rd party DSP’s, sleep timer. Download Shuttle for free on google playstore. MediaMonkey is quite one free music playing app on android phones that has loads of good feature. It has a library that can be categorized according to albums, audio books, artists, tracks, podcasts, genres, and can even sort songs by composers. It is quite crazy if you ask me. MediaMonkey has a magnificent feature that enables you sync your music library from your computer to your android phone over WiFi. It also supports Android Auto casting. Its UI is simple, smooth, and easy to navigate. It has the free version which is quite a handful and also the paid version. Major Features Of MediaMonkey: Syncs library from android phones to PC, Chromecast, sleep timer, tag editor, home-screen widget, seek bar of a song can be placed in notification panel and so on. Download MediaMonkey for free on google playstore. 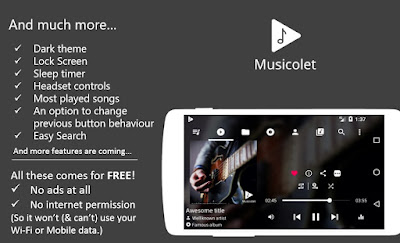 Musicolet is the best ad-free music player on android phones that allows you control the music player using your earphone button. It supports a variety of music formats, and includes a nice multi-queue manager used for queuing up multiple albums or music playlist. Its developers claim to be the only music player for Android that supports multiple playing queues. Its UI is lightweight and easy to access and it has tabs for folders and playlists. Musicolet also has a lyrics viewer and offers no in-app purchases. It doesn’t possess so much features but rather is all about functionality. Major Features Of Musicolet: Supports multiple queues, tag editor, widgets, sleep timer. Download Musicolet for free on google playstore. While Xender isn’t supposed to be on this list as it is a file transfer and sharing app it also comes with a music player for free, that is quite very simple, good and efficient. The music player focuses more on functionality and style and I included it because most Android phones users have them installed on their smartphone and why download another music player when you have Xender that is best at sharing music, files etc and then its own music playing services. Major Features Of Xender Music Player: Music on your Xender can also be imported from mobile to PC over WiFi, simple but effective UI. Download Xender for free on google playstore. Deezer isn’t a local music player but rather a music streaming application on android phones which is quite popular and best at what it does though not as popular as Spotify, it is included in this list for users who love streaming music on android rather than downloading so as not to cramp up their phone's internal storage. It was founded in Paris, France in 2007 and is available in over 180 countries. Deezer delivers on-emand streaming music from various labels and has a library consisting of more than 50 million songs. Major Features Of Deezer Music Player App: A Flow feature that learns your taste based on music you play and those you skipped then re-configures to always gives you songs that you’ll most likely want to hear. Download Deezer Music Player App for free on google playstore. BlackPlayer has a free version music playing app on android that gives most users the best features they need and deserves. Its UI very simple and the font and color can be edited with custom values although the default theme color is black as its name suggest. Its UI is controlled by swipes and gestures that make it elegant. The music player app is also ad-free. The paid version possess more features that an average user won’t need and is suitable for android users that want a whole lot more style for their music player. Major Features Of BlackPlayer: 5-band built-in equalizers, ID3 tag editor, widgets, sleep timer, gapless playback, lyrics viewer, customizable themes etc. Download BlackPlayer for free on google playstore. If you feel we might have skipped your best music application player for Android phones please do tell us in the comment box below.